world go by. Enjoy a leisurely breakfast in the cafÃ© serving the best bacon and eggs around or a barista made gourmet expresso coffee. 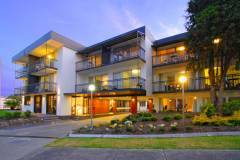 The rooms offer pillowtop beds, LCD televisions, iPod docks, Foxtel and balconies."